MiG-29 unknown number, Bulgaria 2014: 25 years of MiG-29 in service of the Bulgarian Air Force. April 2012: MiG-29UB #11 crashed near Plovdiv, during Thracian Star 2012 exercise with the US F-16s from Aviano. Pilots ejected safely. Since 2004 Bulgaria is in NATO. Annual international exercises in Graf Ignatievo and Bezmer air bases. Some aircraft have silhouettes of A-10s or F-15s "shot down" during exercises, painted in blue on the left tail. 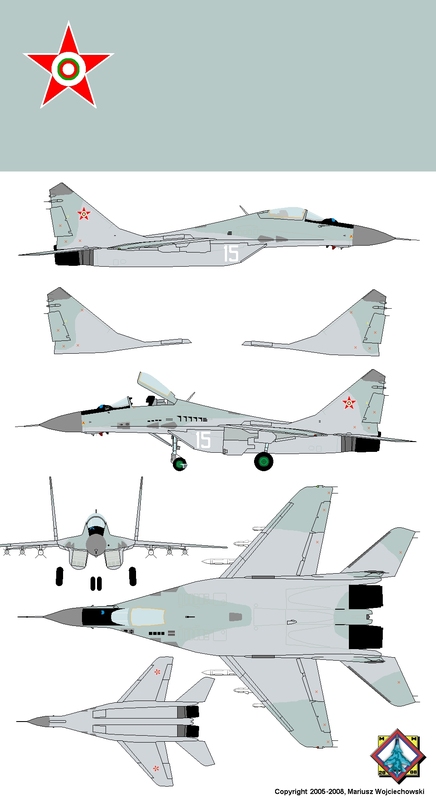 MiG-29 #30 has four silhouettes of A-10s of the 81st FS "shot down" in Cooperative Key 2001 exercise (9 NATO members and 13 Partnership for Peace countries), the MiG #33 - one F-15. In 2002 there was a tender for overhauls 16 MiGs: FGUP RSK "MiG", Elbit (Israel), EADS (Germany), 558th ARZ (Belarus) and IAI (Israel) - won by MiG. 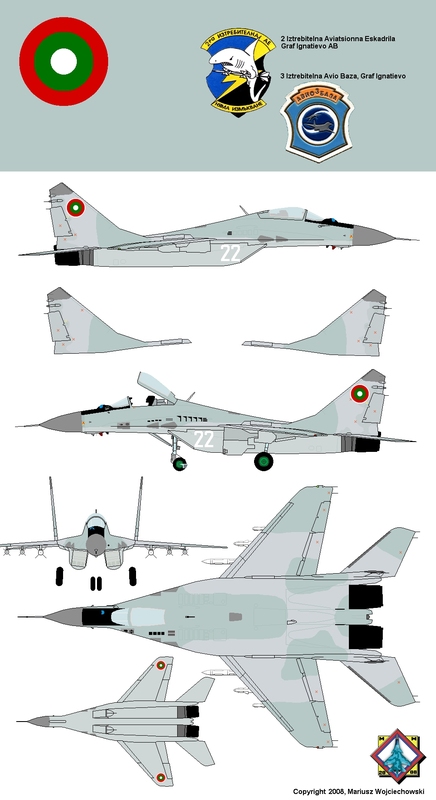 Due to lack of money, MiGs were overhauled not till 2007 in Bulgarian repair plants "Temer" and "G. Benkovski Plant" in Plovdiv with cooperation and under direction of the RSK "MiG" specialists; first flights in November (#32) and December 2007, end of modernization about Summer 2009. Life durability extended from 2000 to 4000 hours or 40 years. Still painted in original standard camouflage - yes, I know that sounds a little incredible, but many good quality photos from 2010-2017 shows that overhaul didn't mean re-painting (or they were painted in exact the same shapes and colours). 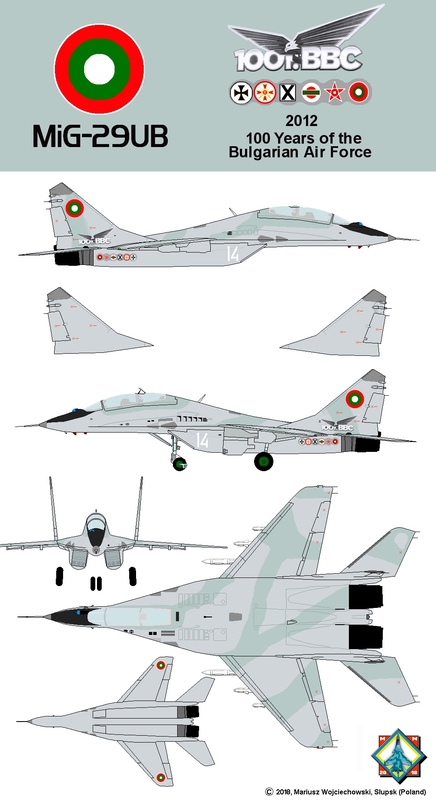 2009: for the first time in years, Bulgaria start training of a new pilots: six for Graf Ignatievo and another six for Bezmer air base (where is the joint American-Bulgarian military training facility and big American base established in 2006). In late 2017 some pilots refused to fly MiGs because of insecurity. In December 2017 was a tender for overhaul and 4-years maintenance of 12 MiG-29 and 3 MiG-29UB. Bulgaria choose Russian Aircraft Corporation MiG, but Ukrainianian state defence concern Ukroboronprom complaint to decision. In the begining of 2018 operational is approx. 7 aircraft, desperately needs overhauls. MiG-29UB #33, Bulgaria 2007 (Sentry Lion exercises). 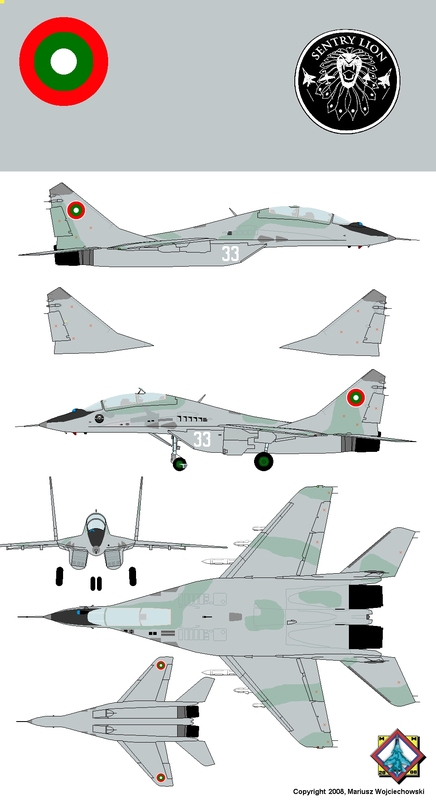 Insignia of Bulgarian air forces: 1914-1918, 1937-41, 1941-1944, 1945-1948, 1949-1992, since 1992 up to day.